Okay, so I know that I shouldn't be eating potatoes and pasta in one sitting, but I decided to live a little bit. Dan wanted to do a romantic night of cooking a badass dinner for both of us and renting Changeling. Well, his idea for steak sounded awful to me, particularly since I don't eat red meat. 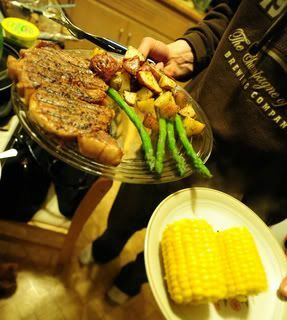 He wanted roasted garlic new potatoes and asparagus. I agreed as long as he went to the store and got the asparagus and picked up some thin wheat pasta for me. 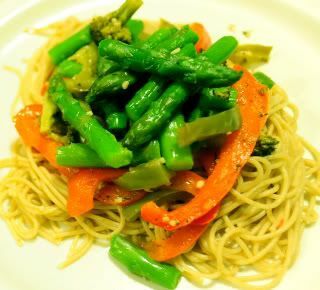 *the asparagus and broccoli can either be raw and sauteed with the rest of the veggies, or if you do microwave pouches, add them just before putting the mixture of all veggies onto the cooked pasta. Spray a pan with nonstick cooking spray. Coat chopped veggies (except for asparagus and broccoli if using pouch cooking) with extra virgin olive oil. Put the veggies into the pan on medium heat. When the veggies start to warm up, sprinkle with black pepper, Italian seasoning and mix in the garlic. Pour water into pan and cover, steaming for 10 minutes or until veggies are tender. Meanwhile, boil noodles in a pot until they are at your desired tenderness. Drain the noodles when finished, pour veggies on top and voila! Top with light butter and Parmesan cheese for a nice extra flavor. Preheat oven to 450. Line cookie sheet with aluminum foil. Wash potatoes and cut into bite-size pieces (I do eighths.) Put the pieces in a bowl and stir in the olive oil until pieces are all coated. Mix in all the seasonings and stir until evenly coated. 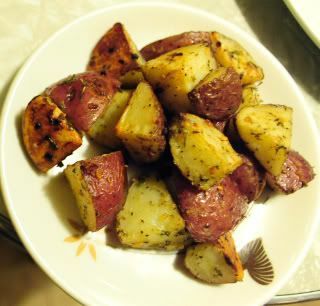 Put the potatoes on the baking sheet and cover it with aluminum foil. Bake for 20 minutes. After the 20 minutes, remove the top sheet of aluminum foil and put back into oven for another 15 minutes to get the outside nice and crispy.